Rocky Patel Vintage Series 1990 are one of the company’s most decorated hand-rolled premium cigars lines. The Vintage 1990 features a perfect blend of Nicaraguan and Dominican long-leaf ligero fillers, binders from Honduras, and highlighted by a 12-year-old Honduran Broadleaf wrapper. Each of these premium cigars are mild to medium-bodied in strength offering a perfect balance of flavor, complexity and richness, resulting in a smooth and satisfying smoking experience. 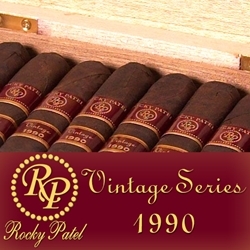 The Rocky Patel Vintage Series 1990 was the first cigar line to display the Rocky Patel name. Today, cigars connoisseurs the world over who love a relaxing high-quality smoke, consider these handmade cigars their go to brand. We believe you will too! Smokers Discounts offers the perfect way to unwind with the Rocky Patel Vintage Series 1990. Every cigar purchased on our online cigar store can be delivered right to your front doorstep. We’ve made it easy and affordable to buy hand-rolled cigars. A variety of sizes and flavors are listed below, each of these styles are in stock and available for a low discount price! Call us for more details!